For the past couple weeks I have been using the Meaningful Beauty skin care regime by Cindy Crawford. The first thing I noticed when it arrived was how beautifully it was packaged and it made me excited to try it out. I will say that I am not normally a 7-step skin care regime kind of a girl but I was willing to give it a try. 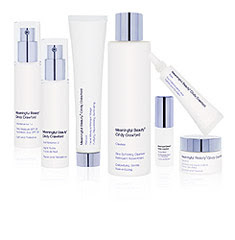 Meaningful Beauty is an exclusive age maintenance skin care system that helps rejuvenate the skin and diminish the visible signs of aging. With a minimum of seven key ingredients in each of our treatment formulas, Meaningful Beauty will help protect and renew your skin in a powerful new way. Meaningful Beauty promises real results in as little as 4 weeks. The website says that it will smooth wrinkles, reduce skin blotchiness, improve skin moisture, decrease skin roughness and reduce skin redness. As I mentioned I have only been using Meaningful Beauty for 2 weeks but I do think it has already begun to work on my skin. The Skin Softening Cleanser is great. It doesn't leave your skin all tight and dry which I really appreciated. The Day Moisture is SPF 20 and does have the tiniest "sunscreen" smell to it but it is not greasy in any way. My favourite product is the Night Fluide. It feels just lovely going on because it is light, not heavy like so many other night moisturizers I've tried. It definitely left my skin softer. The Eye Creme is supposed to "combat puffiness, dark circles and fine lines". I haven't noticed any change in my eyes yet but I still have 2 more weeks to go so there is hope! The Skin Revitalizing Serum is supposed to "transform dull, tired skin into fresh, glowing skin". I did not use the serum everyday because the directions say to use it "as an instant pick-me-up for a special event or any time you want to look radiant." Honestly the couple times I used it I didn't notice any huge difference but it sure sounds nice! The product I found most difficult to try was the Facial Masque. It takes 20 minutes and you are supposed to use it twice a week. I managed to use it once in the past 2 weeks. I have 3 kids... I NEVER get 20 minutes to myself in the bathroom. Ever. But the one time I used it I admit that it made my skin feel absolutely lovely afterwords. All in all I am very pleased with the Meaningful Beauty product line. I have ultra sensitive skin and I had absolutely no trouble with these products. Nothing made my skin itch or turn red. Perfect. I admit that 7 steps is still a little much for me but I do think it would make a huge difference in my skin given a little more time. You can purchase an introductory 30 day supply of Meaningful Beauty online for $39.95 Canadian or $29.95 American and it gets delivered right to your door. I will say the prices are a little too steep for me. I very rarely spend $40 a month on skin care products. But if I did want to spend that much money I would definitely consider the Meaningful Beauty skin care regime. I enjoyed reading your review. I will admit I have been a little down lately and when I read that "Meaningful Beauty will help protect and renew your kin in a powerful new way" I thought this was the product for me... Ok seriously I know it was just a typing error but it just struck me as funny and I had a great chuckle! And more than all this, I am thankful for your kind words and prayers. You are a great friend!